Expand your amp's speaker setup with ease. 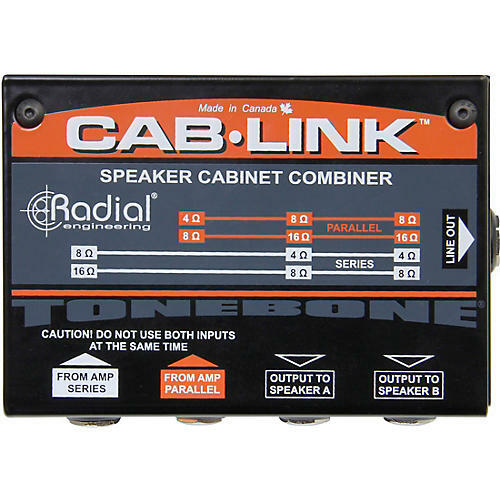 The Tonebone Cab-Link provides a simple and compact solution for players who have a single speaker output on their amplifier but want to connect two cabinets simultaneously. Completely passive with no need for power, the Cab-Link combines two cabinets in either series or parallel configuration, which allows their total impedance to match the output impedance of the amp. Both cabinets are connected via speaker cables to outputs A and B and an easy-to-use guide on the top of the Cab-Link lets you know which input to connect your amp to, depending on the impedance ratings of your cabinets. For example, if you have two 8 Ohm speaker cabinets, they can be combined in series for a 16 Ohm amplifier or in parallel for use with a 4 Ohm amp. The output of your amplifier connects to one of two input jacks; use either the series or parallel input depending on which configuration is required. The Cab-Link also features a line out, which provides additional functionality and can be used to feed another amplifier or an effects unit. A dedicated level control allows for fine-tuning of this output. The Cab-Link can easily handle amp outputs of up to 400 watts with a military-grade circuit board and a solid-steel chassis to ensure years of trouble-free operation.